Since being awarded the Grand Prize of the International Printmaking Division at the São Paulo Biennial in 1957, he has been awarded numerous times at various international art exhibitions and is said to be one of the leading copper-print artists in the world. He moved in San Francisco in 1981 where he continued pursuing his art for 15 years. He finally returned to Japan in 1996 and passed away in 2000. 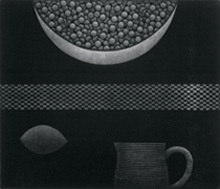 The Encyclopedia Britannica in the item of “Mezzotint” says, “It’s most distinguished mid-20th-century advocate, HAMAGUCHI Yozo, a Japanese artist living in Paris, developed techniques for printing color mezzotint.” Hamaguchi’s techniques reflect a delicate and tranquil ambiance in his artwork, and his international recognition elevates him as one of the greatest masters of printmaking. I returned to Japan in 1996 after spending many years in France and the United States. As I approach my 90th birthday, I was able to find a permanent space to display the pieces I brought back home. The completion of this small and humble space is the most wonderful reward for me as an artist. Having spent many years working with mezzotint techniques, each works carries its own set of memories and is invaluable to me. This art museum will display works from my earlier years to my more recent pieces. I hope that the younger generation studying prints will take the time to visit my collection, and I look forward to the development of a new generation of print artists. 1909 Born in Wakayama prefecture as the third son of HAMAGUCHI Gihei and Yuki, into a prominent soy sauce producing family. Father was the 10th president of Yamasa Shoyu. 1927 Enters the Department of Sculpture at the Tokyo University of the Arts (formerly known as the Tokyo National University of Fine Arts and Music). 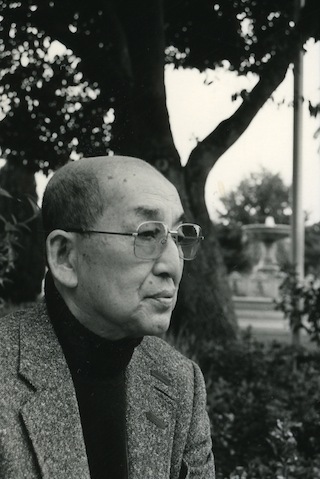 1930 Withdraws from the Tokyo University of the Arts and moves to France with the advice of Ryuzaburo Umehara. 1939 Returns to Japan upon the outbreak of WWII. 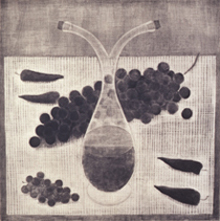 1951 Opens an one-man exhibit on copper-plate prints for the first time in Formes Gallery. 1953 Returns to France and resides in Paris. 1954 Awarded best art piece at Contemporary Art Exhibition of Japan the Modern Japanese Art Gallery for “Spanish Oil Bottle” and “Gypsy.” Becomes a member of the Salon d’Automne. 1958 The Ninth Mainichi Newspaper Art Award at International Exhibition of Drawings and Engravings of Lugano in Switzerland. 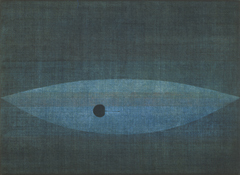 1960 Chosen as the Japanese representative at the Venice Biennale. 1961 Awarded the grand prize at International Biennial of Graphic Art, Ljubljana in Yugoslavia. 1966 Awarded at the Kracow International Print Biennale in Poland. 1977 Awarded the Sarajevo Fine Art Academy Prize at International Biennial of Graphic Art, Ljubljana. 1981 Moves from Paris to San Francisco. Awarded Cultural Award of Wakayama Prefecture. 1982 Receives the Grand Prize for “Watermelon” at The Northern California Regional Print Competition. 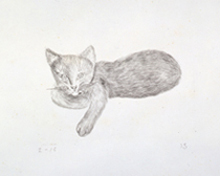 1983 Holds an exhibit of his mezzotint works in NYC and San Francisco. Receives the Key of the City from the Mayor of San Francisco. 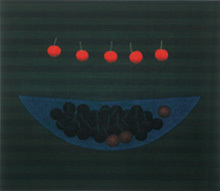 1984 “Cherries and Blue Bowl” is used for the commemorative posters of the Sarajevo Winter Olympics. 1985 Held a retrospective exhibition in Tokyo Yurakucho Art Forum and The National Museum of Art, Osaka for the first time in Japan. Becomes a member of the Royal Academy of Fine Arts Antwerp. 1986 Awarded the Order of the Rising Sun, Gold Rays with Neck Ribbon. 1988 Holds a retrospective exhibit at the Museu de Arte de São Paulo and Museum of Antioqua in Columbia. 1990 Holds a retrospective exhibit at the Tokyo Metropolitan Teien Art Museum. 1992 Holds a retrospective exhibit at the Otani Memorial Art Museum in Hyogo prefecture. 1994 Awarded first prize in print at the North American Art Review.Holds a one-man show at the Musashino city Civic and Cultural Center. 1998 Holds a join exhibit with MINAMI Keiko at the Tokyu Department Shop Kichijyoji branch. 1999 Holds a exhibit “HAMAGUCHI Yozo – Monochrome Works” at the Sakura City Museum of Art in Chiba prefecture. 2000 Passes away at the age of 91 on December 25. 2002 The retrospective exhibition “Master Print-Maker of 20th Century – HAMAGUCHI Yozo Exhibit” tours major art museums in Japan. 2009 An exhibit honoring Hamaguchi’s centennial held at five locations in Japan. The Museé Hamaguchi Yozo：Yamasa Collection hosts an international competition of intaglio in his honor and awards a grand prize and two runner-up awards. All contests’ works exhibited at the museum. Copyright © Musée Hamaguchi Yozo : Yamasa Collection. All Rights Reserved.